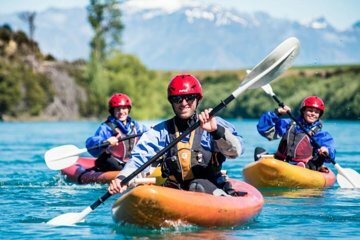 This half-day kayak tour on the Clutha River is an ideal trip for active travelers who want to try a new outdoor adventure sport, or who want to perfect their kayaking skills. Your guide will give you a full safety briefing and educated you about river safety, so you can feel confident on the 13 miles (22 kilometers) of river. Plus, receive personalized attention on a small-group tour. Enjoy a fun day paddling on the river—expect to get wet!